JUNE proved to be one of the most successful months ever with prices exceeding expectations. The June 21 sale included a library of 18th and 19th-century antiquarian books in 278 lots. In excess of £100,000 was realised, with interest from Britain’s most distinguished book specialists and from a wide range of overseas bidders. A first edition of the Encyclopedia Britannica, published in Edinburgh in 1771, sold for £5,000, despite lacking four illustrations. An Amsterdam-published volume of 1699 by Messrs Sansom, Description de Tout L’Universe, made £3,900; the first English edition of Baron de Montesquieu’s Spirit of Laws, 1750, sold at £3,200; a small work on the early conquest of Mont Blanc by De Saussure, 1788, realised £2,700 and John Callander’s Terra Australis Cognita, from 1766, made £2,600. Very many other four-figure prices were realised for these books, most of which were bound in calf and in above average condition. The following week, the Fine Art and Antique Sale focused on good jewellery from private vendors. A good diamond cluster pendant sold for £3,900 and a 39-diamond line bracelet made £2,300. A delightful diamond, emerald and sapphire brooch of asymmetrical heart shape was much admired and realised £2,100. A rare 18th-century Dutch waiter or small salver with Utrecht hallmarks went to a Dutch buyer for £1,100. Eastern rugs were a feature with an interesting Kazakh-style rug selling for £4,200 and the better quality antique furniture showed a rise on previous sales. A nice quality Victorian walnut credenza made £1,700 and a small Georgian mahogany chest of drawers at £2,150. Pictures included a small but finely executed watercolour of mist on Scafell by Edward H Thompson, at £800, with a number of other Thompson watercolours attracting good demand. 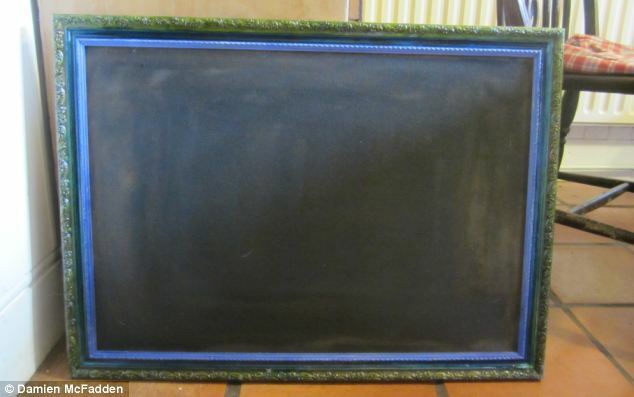 Also at £800 was a small oil sketch of a Venetian view by the contemporary artist Ken Howard. More unusual lots included a framed Liverpool Club 1990 season shirt, signed by Kenny Dalglish, from the Liverpool v Real Sociedad Testimonial match of August 14 – together with a signed programme and match ticket – which sold for £460, and a rare Beswick figure of a horse in “rocking horse grey” colours, which went at £520. Our next sales will include a special collector’s sale of railwayana, a summer antique sale of jewellery, silver porcelain and pottery, general antiques and works of art, pictures, clocks and Georgian, Victorian and Edwardian furnitur. Her peers would have treated the job with indifference or left it to their parents. But Rose Canham is no ordinary teenager. When her room started to fall into disrepair, the 15-year-old from Northamptonshire armed herself with an upholstery gun and paintbrush and decided to do it herself. Hailed as Britain’s young home improvement heroine, the 15-year-old rolled up her sleeves and transformed her bedroom into a boudoir fit for a queen. Rose first started experimenting with DIY when she was just a toddler creating collages from scraps of material collected from her DIY enthusiast godmother, Cheryl Stonehouse. But as she approached her teens, the youngster who says she has been inspired by the original queen of craft, TV presenter Kirstie Allsopp, truly began to realise her talents. 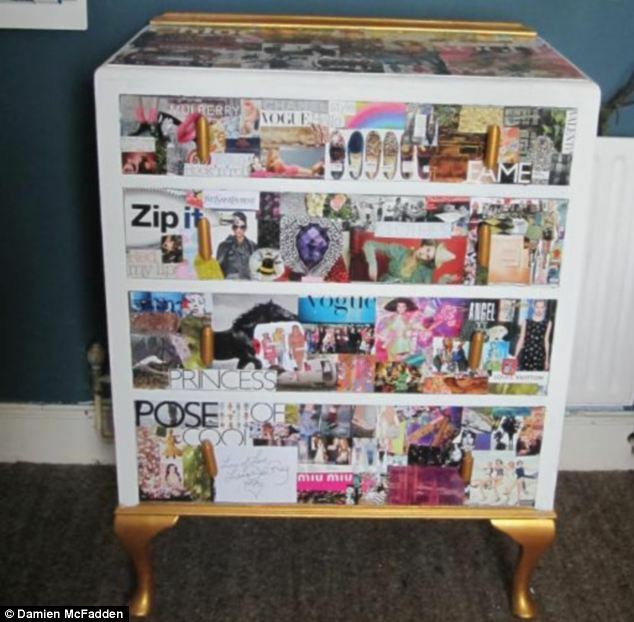 Earlier this year the teenager gave a dusty old chest of drawers the makeover treatment stripping back the dull blue paint and using recycled photographs from Vogue magazines to cover it finishing with a lick of varnish. But this was not the end of Rose’s DIY ventures and she soon found other pieces of furniture to renovate. 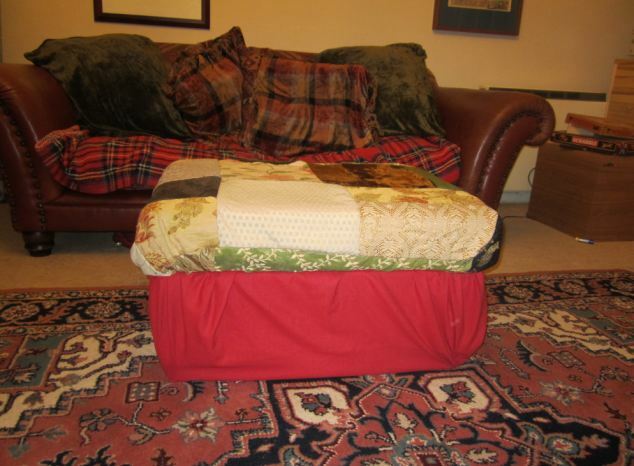 She re-upholstered a leg rest from a car boot sale with a patchwork cover and used gold bars to give her fireplace an antique look. But it was the paintwork on her bedroom wall that really got Rose noticed when she used masking tape to create perfect stripes of bold blue and teal. Rose, who lives with her parents, Elaine and Steve, and brothers, Lee, 25, and William, 12, in the village of Crick, now gives other youngsters hints and tips about DIY on YouTube videos. 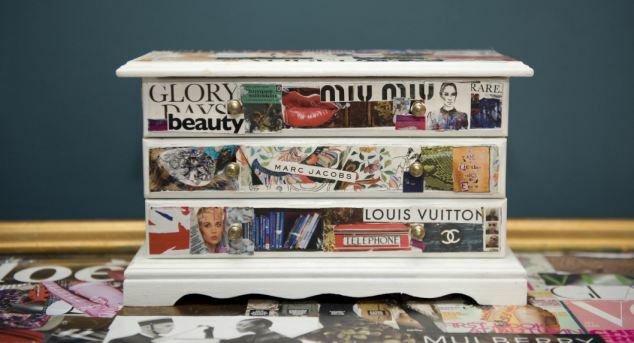 She said: ‘I have always loved making things but I really got into it when I saw Kirstie Allsopp make a decoupage thing where she pasted a map onto a table - it was great so I decided to do something similar with my drawers. ‘I think all children should get into crafts because it gives you a real sense of fulfilment when you create something unique. And now the youngster, who dreams of becoming a fashion designer, has been rewarded for her creative efforts after being crowned Young DIY Ambassador of the Year by home store, B&Q. 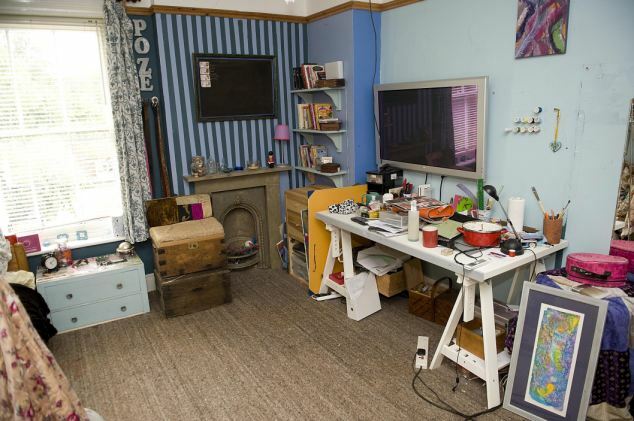 Rose won the competition after she sent in pictures of her bedroom along with an explanation about her designs. Her mother, Elaine said: ‘I am really proud of her. She has always been very creative and is always taking stuff away and bringing it back with a completely different look. George Clarke, architect and Channel 4 presenter who is a B&Q ambassador said: ‘Rose’s work was incredibly impressive for someone of her age, she showed real flair, talent and insight when it comes to interior design and obviously has an eye for what works well when it comes to what colours, materials and fabrics go together – she reminds me of a mini Kirstie Allsopp, my fellow ambassador at B&Q. Now that's we've seen the pic of the room she stores her mish mash of bits and bobs can we see a pic of her revamped bedroom please? What do you mean that's it? Struth, talk about sensationalism! 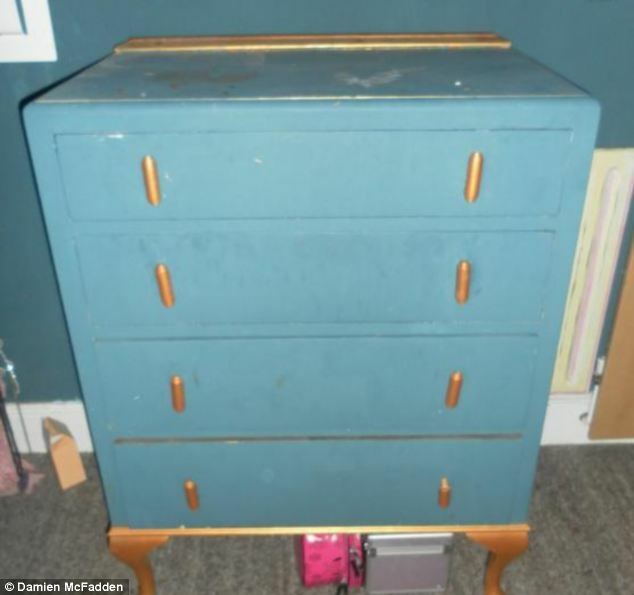 I wonder if she or her family have any idea how much those trunks she is sitting in/on are worth? Seriously? I hope she doesn't damage them, she could sell them and furnish her whole room from new! Anyone who cites Kirsty Allsop as an inspiration deserves nothing but derision! 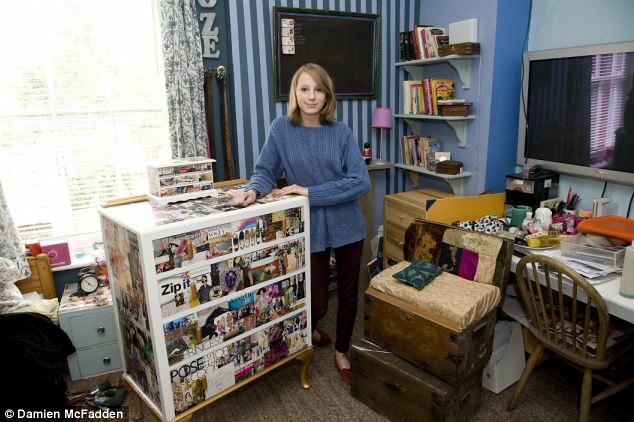 The teenager has given her bedroom at her family's village home in Northants a magical look<<<----- no, sorry don't agree- it looks messy and like shes just stuck some cut outs from a magazine onto a decent piece of furniture, oh wait! she has! i kept scrolling to find the 'after' photos! I don't like to hurt her feelings but it all looks awful, i honestly thought this was a joke article then i remembered it's the DM. I'm not crazy about her style, but she may have a real future in this field, so more power to her. I suspect she'll produce some DIY books someday, perhaps even get a television show, and her style will probably improve and become more sophisticated and interesting. It's nice to see a 15-year-old creatively establishing a career for herself. Good luck to her. She could have cleaned her room first?? Ashley Furniture HomeStores Team Up with Jacksonville Jaguars To Help Thousands of First Coast Kids - YAHOO! The Jacksonville Jaguars (http://www.jaguars.com) and Ashley Furniture HomeStore (http://www.ashleyfurniturehomestore.com) announced today a new multi-year partnership to make Ashley Furniture HomeStore the Official Furniture and Mattress Store of the Jacksonville Jaguars. "Our Ashley Furniture HomeStore team is very excited to continue our support of the First Coast community and hometown Jaguars." says Howard Fineman, Managing Member/CEO of the Ashley Furniture HomeStores based in Jacksonville FL. "Being #1 in Jacksonville is a great achievement, but giving back locally is our real success." "Our work with the Jaguars in gaining further exposure and success for the A Hope To Dream program is going to provide a big WIN for hopefully thousands of local kids and their families in the years ahead, as well as both of our local organizations" says Fineman. Ashley Furniture HomeStore's A Hope to Dream program, which commenced in Jacksonville, FL in January 2011, and continues to spread throughout the national HomeStore network, has resulted in hundreds more mattresses being delivered to kids in need this past month, bringing the number of new beds donated to less-fortunate kids to nearly 3,000. Here in Jacksonville, the local HomeStores' goal is to deliver over 300 free beds in 2012 alone. A portion of proceeds from every mattress purchased at the Jacksonville FL HomeStores goes toward providing free beds to local First Coast kids in need. The A Hope To Dream program, provides free beds to local kids in need so that they can live healthier and more productive lives. "We know that a good night's sleep has a positive impact on all areas of a child's life, from academics and extracurricular activities to relationships with friends and family." says Stephanie Morgan, Regional Customer Care Manager for the Jacksonville FL HomeStores. "Those wishing to nominate a child to receive an Ashley Sleep Memory Foam mattress set and comforter set can visit http://www.AHopetoDream.com. In-store applications are also being accepted at our three local Ashley Furniture HomeStore locations. Winning nominations are chosen based on originality, need and expression of thought." In conjunction with the announcement of the multi-year partnership with the Jacksonville Jaguars, the local HomeStores have also introduced a Special Edition Ashley Sleep 16" Memory Foam mattress that has the A Hope To Dream logos stitched into the bed. "Not only is this possibly the most luxurious-feeling mattress we have ever showcased, but with every purchase of this bed, a local child gets a free Ashley Sleep bed of their own" says Fineman. "This is a great opportunity for our community to make a very positive impact in the lives of local kids, and show their passion for this great cause. Without local community participation, the program wouldn't be where it is today. We really appreciate all of the great support for this important cause." The new Special Edition A Hope To Dream mattress is on display at each of the three Jacksonville FL HomeStores and is already a top-seller. About Ashley Furniture HomeStore. Ashley Furniture HomeStore, the #1 furniture and bedding retailer in the United States, delivers quality, affordable furniture to customers at over 435 independently owned and operated locations in the United States, Canada, Mexico, Puerto Rico and Japan. Ashley Furniture HomeStore is an exclusive provider of furniture from Ashley Furniture Industries, Inc., the largest furniture manufacturer in the United States. "Like" Ashley Furniture HomeStore on Facebook, follow them on Twitter, or see their design-focused boards on Pinterest. The local Jacksonville FL HomeStores - located at St. Johns Town Center, River City Marketplace, and Orange Park @ I-295, are open to the public seven days a week and have over 100,000 sq. ft. of showroom in the local market, including over 50 mattress options on display. Ashley Furniture HomeStore is the #1 Name In Furniture, the #1 Sealy Store in Jacksonville, and the Official Furniture and Mattress Store of the Jacksonville Jaguars. GAIL DUNNETT has enough furniture and accessories to furnish 100 homes, she says, but still she wants more. And, if you're looking for stylish furniture at a deep discount, she might have something for you at her warehouse sale at noon and 5 p.m. July 14. Dunnett, who previously worked as an associate consultant for Bain Capital and then director of merchandising for Pottery Barn Kids, co-founded Studio D, one of the largest Bay Area staging companies nine years ago. "I had a business background and the entrepreneurial bug," she quips. Through Studio D, Dunnett and her business partner, Johanna Meise, have staged homes locally for real estate agents, developers, homeowners and celebrities such as band members of Journey and Green Day. They also run a studio on Sutter Street in San Francisco where they sell their overstock furnishings at a discount and offer free in-store design consultations. Last year, they opened a branch in New York and the new owner of the first home they staged, a $13 million brownstone, "bought everything in it," says Dunnett. Since then, Studio D in New York has been tapped by top real estate companies to stage homes for CNN's Anderson Cooper and singer Katy Perry, and it has been featured on HGTV's "Selling New York." "We'd like to be a national company," Dunnett says. Portrero Hill warehouse and so she's throwing a ding-and-dent sale. "The pieces are between three and five years old and there's nothing that a little tightening and paint can't fix," she promises. "We've had to move things (the furnishings and accessories) in and out of buildings a lot, but it's not like people have been sitting on it or using it. This is way better than the stuff you'll find on Craigslist." 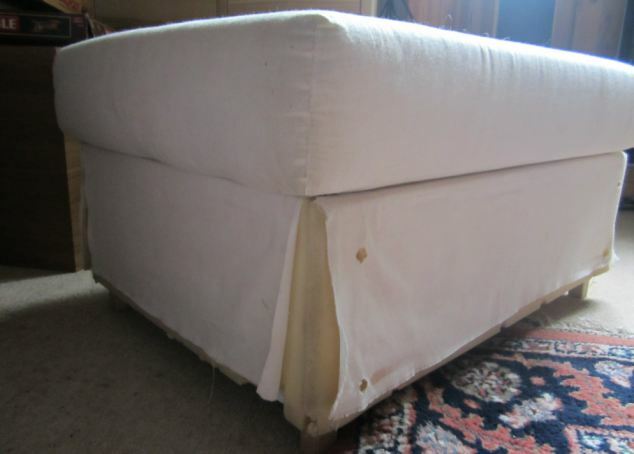 Among the items up for sale will be 16 sofas and sectionals ($250 to $600), 30 leather or upholstered accent chairs ($50 to $250), 15 console tables ($45 to $150), 20 beds and headboards from twin to king-sized ($125 to $275), dining tables ($150 to $195) and rugs ($125 to $200). There are also dressers, nightstands, end and coffee tables, dining chairs, desks, folding chairs, decorative pillows, bedding, throws, table lamps, outdoor benches, chairs and dining tables, art, mirrors and more.  "The biggest thing is a cohesive color story. You don't want a lot of different things going on because the 'eye' doesn't know where to land. It's like too many people talking at once and you can't hear anyone. Generally, it should be lots of neutrals with punches of color in the art and accessories."  "Layering is important. Even developers will buy a bunch of furniture and think that's all there is to it. But it's more than furnishings — it's the art, the throws, the pillows, the orchids."  "Find the right scale for the room. Know whether the rug is too big or the sofa is too small."  "Allow for good (traffic) flow." and entertaining topics every Saturday and also on her blog at DesignSwirl.net. She may be contacted at P.O. Box 412, Kentfield 94914, or at pj@pjbremier.com. More: Credit cards and personal checks with I.D. accepted. Purchases must be removed from the warehouse by the end of the day. Some deliveries to Marin may be arranged for a small fee.